Life and Dandelions: Goodification. Excuse me? I believe in stating the obvious. Calling a spade a spade, because no matter which way you look at a spade it is never going to be a glass slipper is it? Which brings me to the "Goodification" of KFC. The what?? Exactly. What is the Goodification of KFC? Can fried chicken be "goodified"? According to Ogilvy Sydney (the creative agency behind this campaign) "The Goodification project is bigger than just goodifying the KFC experience; it's also about celebrating the everyday moments in the lives of regular Australians. These actions will be the type of things you do that put a smile on other people's faces." Sounds all nice and warm and fuzzy, but what does it mean? In the Oxford Dictionary the word doesn't even exist. However in the Urban Dictionary there is a meaning - A word made up by George Bush to mean "making something good" or the "the making of something good" The goodification in Iraq will be to follow the plan, the plan which we are now in the planning stages of. How does this have anything to do with chicken covered in fifty thousand secret herbs and spices cleverly disguised in a layer of greasy yellow coloured stuff? What about the chips covered in chicken salt or the mashed potato floating in gravy? I'm not sure I get the correlation? Are they intending to make KFC a "good" food or are they going to make it taste better? Excuse me Ogilvy Sydney, but in case you hadn't realised this, KFC is junk food. Pure unadulterated junk food. High in fat. High in calories and not very good for you. Particularly if you eat it every. single. day. Don't get me wrong here - I'm not dissing on junk food. It is part of life. There is a place for junk food in all our lives. Sometimes the only thing that will hit the spot is Big Mac or a piece of greasy chicken or a dagwood dog, especially after a big night out! But let's not confuse things here. KFC will never be fruit and vegetables or a low calorie meal. Never. Perhaps we could extend this theme and "goodify" drinks like Red Bull to make us think we are drinking something akin to the elixir of youth? My point exactly. You can wrap anything up in fancy words and provide images of friends and family having a wonderful time, but when you open the can you are still drinking a high sugar, high energy drink that is not particularly good for you. Why can't junk food be just that? Junk food. It is what it is. Why do we have to make is sound like it is something better? Is this going to stop people eating it? Is it going to encourage more people to eat it? I don't think so. 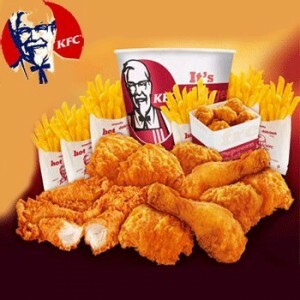 KFC or Kentucky Fried Chicken - it is still fried chicken. It can't be anything else. I really miss the days when we didn't have to make things sound better than they really are. When we didn't have to be so politically correct. When junk food companies didn't have to pretend they are anything but the provider of junk food. Have we become too warm and fuzzy? Do we want everything to be sugar coated? I think we are becoming far too soft. Or maybe I'm just getting too hard and cynical as I grow older? What do you think? I don't think it is about being PC. It is marketing pure and simple and cynical too. We are more health conscious now so dressing up the junk will probably alleviate some of the guilt we feel when we step through the doors of these sort of places. What a word! "Goodification". Not surprised that it was first spoken by W.
You totally goodified that post, baby. My God what will they come up with next... Pure spin! I'll bet it took Olgivy a while to come up with a way to make KFC seem ok to ingest! They changed thier branding to the initials KFC to stop everyone associating it with the word 'fried' about 10-12 years ago, I think. It is marketing, playing to the masses. Nothing more. PS We had it for dinner tonight (seemed like a good idea after having a few wines) & I feel polluted! Ugh! I agree wholeheartedly - it is marketing pure and simple. I would love to see the Gruen Transfer get a hold of this one and Russell try to justify it! I agree, a spade is a spade is a spade. I'm assuming I'm thinking about the same ad you are, but I took it to be about the 'goodification' of life, where they flew in 100 of this woman's facebook friends from around the world and had a wow of a time. Okay, they ate junk food, but if I was faced with 100 mouths to feed I'd probably buy a few KFC buckets too! Maybe I need to see the ad again. Yep. Let's all be clear and call it what it is, what we know it is. Look, I'll admit that some days all I want is KFC, granted not very often but the days do come. I know it's junk, but I still want it. I don't need it goodified. I actually want to acknowledge that it's junk, but that I'm eating it anyway. As for the ad, all I could think was who gets these opportunities? I'd love to get 100 of my FB friends together, even if it was for KFC! How do I get to do that? They got dragged kicking and screaming to stop using palm oil, which apart from being very cheap, is very unhealthy, any semi-responsible company would have done this years ago when the problems with palm oil where known, and alternatives where available.